With the rapid development of refining industry from waste plastics, waste rubber and waste oils, the produced fuel oils by these industries are more and more widespread applied and adopted, and has been penetrated into all areas of the national economy and people's daily lives. But at the same time, due to the rapid development of these industries and the increase of employees, the price of raw materials also is being greatly increased. So how to increase the fuel oil’s added value and price on the basis of keeping low raw material cost? The easiest way is to distill (or called rectification) again the crude oil which produced from waste plastics, rubbers and dirty used oils. This type of fuel oil is in light yellow or light red color and its technical indexes of quality can match diesel’s standard. There are two methods to produce this type of fuel oil, one is to set up a large-size petrochemical refining unit costs more than 1 billion US Dollars, the other one is to use low-cost earth furnace. Large refining system brings high cost, but earth furnace is with low working efficiency, unsafely, and not environmental friendly. Our company just developed a new system which can solve these two problems, save your cost and increase the working efficiency at the safe and environment friendly working conditions. 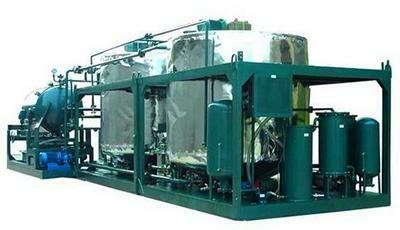 It’s Series FOD-D Waste Oil Distillation System for Fuel Oils. Series FOD-D Waste Oil Distillation System for Fuel Oils can produce the diesel & gasoline from black dirty engine oil, waste lube oil, crude oil, waste plastic oil, and waste rubber oil after through catalytic distillation. Pump the pre-treated oil into heater vessel (distillation kettle), heat the oil upto working temperature (will be upto around 430 ℃ ), then distillation, catalytic, finally diesel and gasoline are obtained. Stop heating when reaction of waste oil is completed, in the distillation kettle, remove all the remaining residues, then all system can be reused for next time. Easy to operate, 1 ~ 2 workers can easily operate the machine. Series FOD-D System can recycle & distill various dirty black oils including waste engine oil, lube oil, gasoline oil, diesel oil, plastic oil, and other lubricant oil, and convert them to diesel oil and gasoline oil. High quality and quantity of refined oil obtained through output, no any discoloration caused by oxidation, no any bad smelling/ odor. 1) catalyst chemical, cost less than USD 30 to refine one ton of waste oil. With High degree of automation in the whole operation, advanced designing and fabrication technology. Adopt the water circulation method on atmospheric and vacuum distillation unit, very safe. And after decompression on the whole system, refined oil’s production quantity and quality are increased obviously. The whole process is performed without acid and clay which are forbidden in many countries already.